Skirted Bed Coverlets information please include.We have shown the skirted coverlet to the floor. ( fabric shown on skirted coverlet is Pique white) The option is and upgrade for a skirted coverlet. The drop is the measurement length of the top of the bed mattress to the floor, please indicate this in the comment section. Price: $498.00 In stock! - Browse this brand: Jane Wilner DesignsOur products are custom made to your specifications. This product ships up to 7 weeks after your order is placed. Choose from our 2 choices of fabrics for you item. The Coco Matelasse is 80% cotton and 20% polyester in a diamond matelasse. The Pique is 50% cotton and 50% polyester. Please choose your size coverlet. 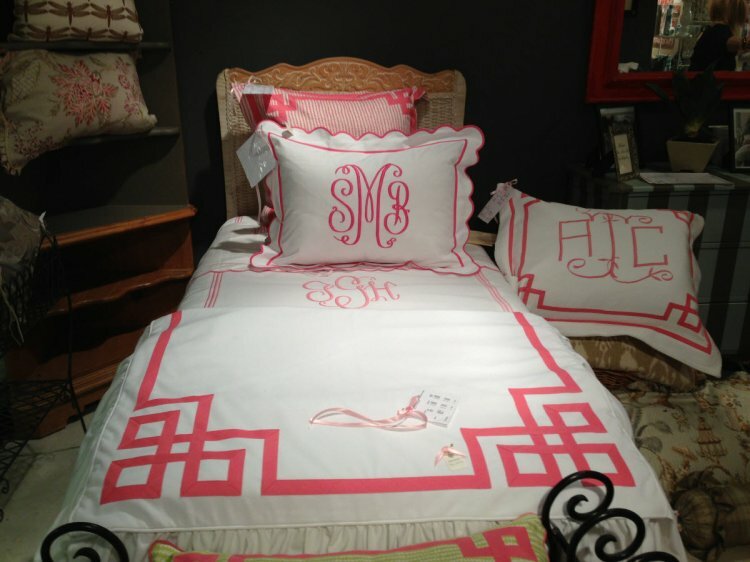 The price will include the 12 inch monogram. Below are the sizes - please note the Coco Matelasse is a little larger in size. Bed coverlets have a 14" drop from the top of the bed. 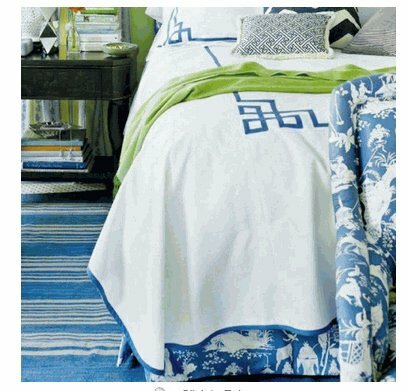 We have added the new option of the Skirted coverlet as shown in the picutre of the blue trimmed bedding. We need the measurement of the top of the bedding to the floor. Please add that in the comments section. The skirted coverlet has the longer skirt. The standard coverlet will fit the bed like a quilt. Please choose your pattern design for your Blanket Coverlet or Duvet. This coverlet will lay on the top of your bedding and have a 14 inch drop from the top edge of the bed. Please notice in the choices of which patterns are using the tape trim and which patterns are using the embroidery trim. Please notice that a few designs can ony be used on the Coco Matelasse- This is becuase the tape needs a heavier fabric to make the bedding hang properly. This is also the design choice for the duvet. Choose your tape color. Tape trim is used in the welting options and the scalloped otpions only. We can match the thread to your tape. If you would like the embroirdery trim options then just skip this step and use the thread section. If you do not see a tape color you may send us a swatch to match a color choice. Since we always try and match the embroidery monograms to the tape you have the option next of selecting match thread to trim tape. Choose your thread color. 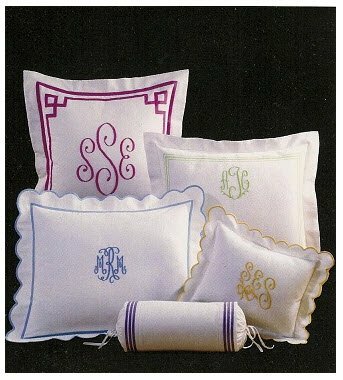 Please use this chart to choose your color embroidery monogram. 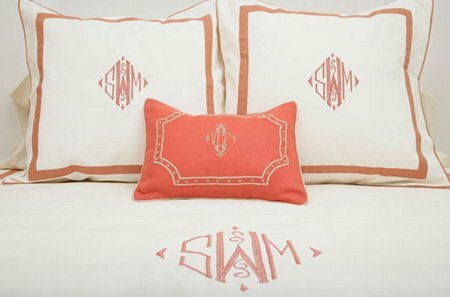 If we are choosing a tape trim on your bedding and wish to have us match the trim and yoru embroidery monogram thread just choose match trim as a color option. If you would like us to match a swatch you have please mail us a swatch. See contact information on where to mail your swatch. 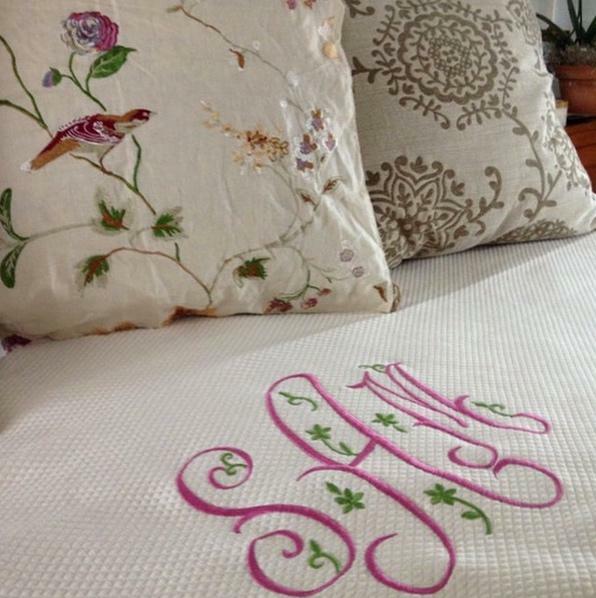 Choose from one of these elegant fonts for your bedding. Note: fonts are a satin stitch unless it states a Chain stitch.